The dhole (Cuon alpinus), a canid, is categorized as Endangered (EN) on the IUCN Red List and is listed as a category II protected species in China. 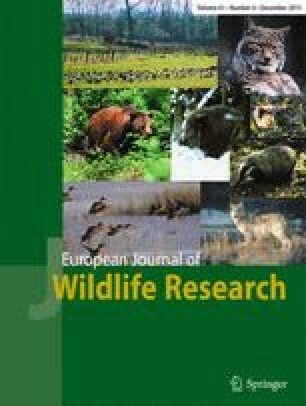 Presence-absence data are extremely rare in western China, and possible existence of remnant populations of dholes is not clear. Here, we document new records of dhole in a protected area in an arid region of the Altun Mountains in Xinjiang Autonomous Region in western China. From a total of 4517 camera-trap days at ten water sites between 2011 and 2013, we obtained seven independent records of dhole at three sites. Additionally, another reserve in Gansu Province which is located near Altun Mountains also recorded the species through camera-trap surveys. Our results indicate that dhole populations exist in the vast arid region of the Altun Mountains, and the current distribution of the dhole might be widespread in western China. We suggest that conservation efforts in this region should focus on minimizing the persecution and poaching of both dholes and their prey. This study was funded by the National Nonprofit Institute Research Grant of CAF (No. CAFYBB2011003), and Special Project of National Scientific Fundamental (2012FY111700). We thank the Administrative Bureau of the Xinjiang Lop Nur Wild Camel National Nature Reserve, the Administrative Bureau of the Gansu Yanchiwan National Nature Reserve, and the Administrative Bureau of the Gansu Dunhuang Xihu National Nature Reserve for providing useful information and support for this study. We are grateful to the William V Bleisch for further corrections and constructive comments.